2019-02-06 11:28:102019-02-06 11:28:10https://quickbooks.intuit.com/in/resources/hiring-hr/what-is-employee-referral-program/Hiring & HREnglishEmployee referral is a system in which companies make potential hires through recommendations by existing employees. Here's all you need to...https://quickbooks.intuit.com/in/resources/in_qrc/uploads/2019/02/What-is-Employee-Referral-Program.jpghttps://quickbooks.intuit.com/in/resources/hiring-hr/what-is-employee-referral-program/What Is Employee Referral Program? Chances are that you still swear by the passive ‘post and pray’ approach for luring top talent. Are you expecting ideal candidates to seek you via a posting on job boards? If that is the case, you are unlikely to reach potential candidates. Let’s understand why? You are now searching candidates for job roles that either didn’t exist earlier. Or require radically changed skill sets compared to ones in the past. This is because of globalization, demographic changes, internet and rise of exponential technologies. This decline is a result of increasing uncertainty and falling unemployment rate. More and more qualified employees are unwilling to leave their current jobs. Now, this might be a hint towards improved retention efforts undertaken by companies. We see automation and increased use of AI coming. This is making companies adept in identifying quality employees. They know that retaining and nurturing quality talent calls for offering a right employee value proposition. Hence, they are focusing on providing positive employee experience over simply offering attractive pay packages. Generation Y, also known as millennial, would make 35% of the global workforce by 2020 and 75% by 2025. Now, these are younger candidates who have different expectations from employers. They demand greater engagement by companies. Hence, companies would have to align their recruiting strategies. They would have to reach out to these younger candidates the way these candidates want. For instance, such candidates check for open positions on their smartphones, learn about the company, its products, work environment etc on social media platforms. Hence, companies need to invest in building strong employer brand to reach out to them. Further, recruiters will have to become marketers of the job roles they wish to fill. In addition this, they will have to invest in employer branding, create talent pools and nurture potential candidates. The rise of gig economy too is making employers rethink their recruiting strategy. Top executives globally believe that the workforce mix in the times to come will have more of contractors, freelancers and gig workers. Unlike earlier times, when candidates approached employers, its employers who now seek top talent. With immense competition giving multiple choices to potential candidates, reaching out to them is becoming difficult. Job roles are changing and so are the ways in which potential candidates look for professional opportunities, employers are now altering their people strategy. They are shifting from passive ‘post and pay’ approach to proactive recruiting methods to make potential hires. And out of all the sources, talent teams rank employee referrals as the most important source of hire. Where 82% employers rated employee referrals above all sources for generating best return on investment, 88% rated it as number one source of quality hires. So before going any further, let’s first understand what is an employee referral program. Employee referral program is an internal method of recruitment. It is a system in which companies make potential hires through recommendations by existing employees. Existing employees are motivated to harp on their social and professional networks to fill open positions in the company. Needless to say, talent teams are increasingly dwelling on employee referrals for quality hires. Still not convinced with why your company must have a strong employee referral program? Well, read on further to know how you can benefit from a well devised employee referral program. Time is money! And if that is something you believe in, consider the most valued sources of hire sitting right under your nose. Your employees, your company’s brand ambassadors. They have a huge network of qualified persons and can dwell on that to help you connect with potential candidates, saving you both time and money. Traditional methods of hiring such as posting on job boards, updating on career websites or hiring external recruiters can take upto 55 days from screening to final selection. Whereas it takes on an average 29 days for referred candidates to get hired. Employees forming part of your team positively impact your company’s bottom line. Hiring quality employees for your company calls for investment of both time and money. And as a business owner, you would want to derive maximum return from this valuable investment. Did you know that an average US employer spends $4,000 and 24 days to hire a new worker? There are a variety of costs involved in hiring employees. Let’s have a look at the average spend on each of these against the employee referral cost. Given this, look at the money spent by companies on employee referrals. Employees who refer candidates receive both cash and non cash incentives. Of the companies that give cash incentives for referrals, 69% give incentives between $1000 – $5000. 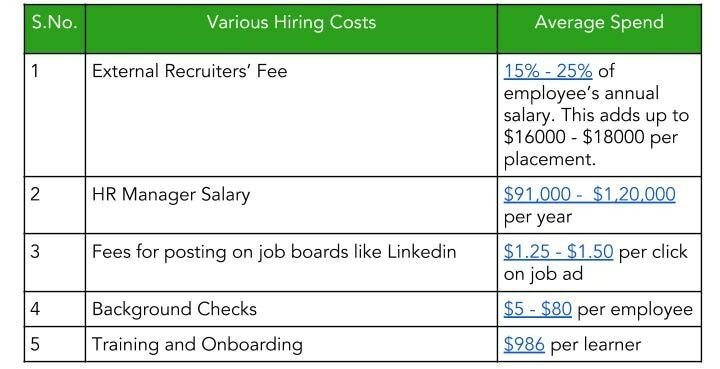 So say hiring via external recruiter costs you $16,000 per placement, a cash incentive, for employee referral, of any amount between $1000 – $5000 helps you save significantly. Another trend noticed with employee referral programs is that performance of existing employees determines the quality of referred employees. A players refer A players. Top performers seek to be valuable resources to their companies. Hence, they refer candidates who too are top performing. For top performing employees, getting quality co-workers in the company is a top source of motivation, external reward like referral bonus comes later. And only 6% do it for money. Employee referrals also help to get passive candidates who form 73% of the talented pool. These come under the most qualified people for your open positions who are either employed or not actively looking for job change. People hired through employee referrals experience higher job satisfaction. Therefore, they stay longer in the company against employees hired via other channels. Following retention figures are the result of a study undertaken by Jobvite of employees hired through various channels. It was found that referred employees stay longer compared to employees hired through traditional means. Existing employees screen qualified candidates for culture fitness. Who better than the current employees have an understanding of the culture and work ethics of the company? Hence they refer candidates who are like them and are a good fit. Current employees themselves want to be a valuable resource to the company. Therefore, would certainly recommend candidates who are best fit for the job. enables employees to track the status of their referral – the hiring manager, date of the bonus amount etc. – via its My Referrals app. gives modest bonuses to employees who refer. With Salesforce’s ERP in the backdrop, let’s understand what elements can make your ERP highly effective. It’s much like doing a job description for the job boards, career websites etc. Your existing employees sure have an understanding of company culture and work ethics. They can pre -screen candidates for cultural fitness. But, they might not be very clear with the open positions and their specific requirements. That way, current employees would get a better understanding of who to refer for the current openings. Employees should have access to a separate link which they can share in their network. Careers page should clearly define job roles and requirements so that it is easy for the candidates to apply. The same way, lengthy and complicated application process, involving too many clicks, stops applicants from submitting CVs. Applicants find it disturbing when they are not updated about the progress since they last submitted their CV. Similarly, employees hesitate to participate in the ERP if they are not updated from time to time regarding their referral status. Therefore, make sure that you keep employees and the candidates updated of the referral process. Keep them in loop, updating what’s happening at every stage – the hiring manager, candidate’s interview feedback, bonus amount due date etc. Pretty much like the way Salesforce does! As mentioned earlier, majority employees do not refer quality candidates for money. Still cash bonuses are widely used incentives for employee referrals. Google tried doubling its cash referral bonus from $2,000 to $4,000. But it didn’t help increasing the referral figure. It came out that people referred potential candidates because they liked working with Google. Although giving cash bonuses is nice, rewarding employees with something that creates lifetime memory can make your ERP really effective. Non – monetary incentives can include day offs, vacations, gifting cars, motorbikes, tickets to events etc. ask employees what motivated them to refer candidates. Make changes, if necessary, to make ERP even more effective. making referred candidates face lesser interviews against the standard hiring process. This tactic too didn’t help much in improving referral figures. What finally worked for Google was ‘aided call’, a concept company took from its marketing team. They saw that employees didn’t undertake an in – depth review of people in their network. Alos, they didn’t have a clear understanding of job requirements. Hence Google, much like its marketeers, made employees think of potential candidates, by asking who they would recommend for particular job roles. Your ERP should be such that it benefits both the employer and employees referring potential candidates. It would be effective only when employers get best candidates and employees, in turn, get rewarded for their recommendation.